After conducting a nationwide search, a new president of the UMKC Foundation and chief advancement officer of UMKC has been named. Lisa B. Baronio, EMBA, will lead the efforts of this independent nonprofit organization to encourage gifts and bequests to promote academic achievement, foster research and elevate intellectual pursuits at UMKC. She will begin her duties on June 17. In this newly defined role, Baronio will have dual reporting lines to UMKC Chancellor C. Mauli Agrawal and the UMKC Foundation Board of Directors. She will also serve on the Chancellor’s Executive Council and will have broad authority to shape and build an advancement program supporting UMKC and UMKC Athletics through annual giving, corporate and foundation relations, major gifts and gift planning programs, endowment, capital campaigns, stewardship and advancement services. “Lisa Baronio has a strong record of successful fundraising in higher education. She will play a key role for us in obtaining the resources we need to make the targeted investments called for in our strategic plan. We are proud to welcome her into our UMKC family,” said Chancellor C. Mauli Agrawal. “The UMKC Foundation is delighted to welcome Lisa to lead the Foundation at this critical moment for the university. We are confident that she has the skills, experience and dedication to achieve, and exceed, the foundation’s goals,” said Tom Bloch, Chair of the UMKC Foundation Board. Baronio comes to UMKC from the University of Northern Iowa, where she has served as President of the UNI Foundation since 2015. She has more than 20 years of education fundraising and management experience. While at UNI, Baronio led the efforts that raised more than $85 million dollars and distributed more than $20 million to support the university. She also led a scholarship initiative that exceeded the $40 million goal by $13 million, and met the original goal 19 months ahead of schedule. 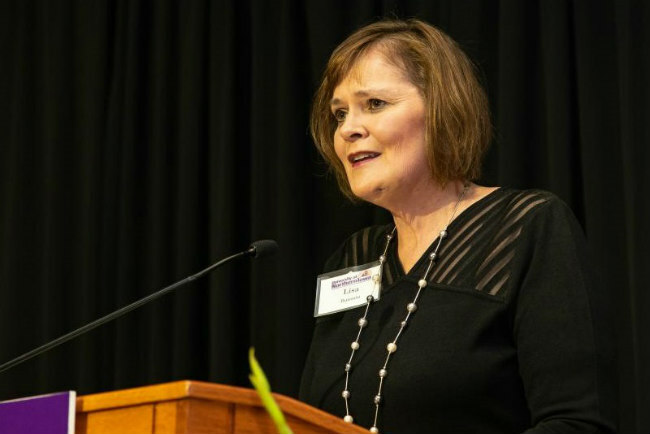 She has also led divisions at Trinity University and the University of North Texas, and held senior positions at the University of Connecticut Foundation and Wichita State University. She holds an EMBA from the University of Nebraska-Omaha and two bachelor’s degrees from the University of Iowa. Co-chairs for the search were UMKC Provost Barbara A. Bichelmeyer and Warren K. Erdman, executive vice president – administration and corporate affairs at Kansas City Southern and University of Missouri Board of Curators emeritus member and chairman.